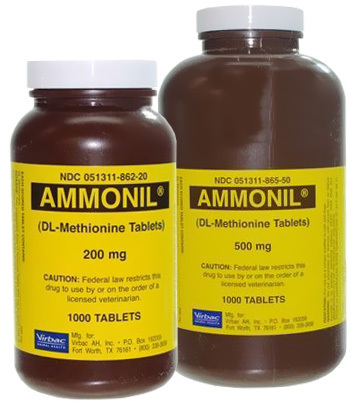 AMMONIL® Urinary Supplement is a dl-methionine supplement for use as a urinary acidifier in cats and dogs. DL-Methionine is used to acidify urine in both dogs and cats. Urinary acidifiers are used when the pH of the urine is too high, causing struvite stone and crystal formation. It may help in dissolving struvite stones with time and preventing stone recurrence. DL-Methionine is available as a flavored tablet in 200 mg or 500 mg strengths and as an oral gel.